This, in essence is the story of any romantic movie/book. This (of course, minus the villain trying to kill hero) is the story of any Sooraj Barjatya movie. And, this (of course, minus the songs and stuff) is the story of “The Princess Bride ”. So, when I tell you that this story is a roller-coaster ride, you better believe me. The ride starts from the farm where Buttercup (an apt name, don’t you think) and Westley grew up and goes on to the palace of the Prince Humperdink, then onto the tall Cliffs of Insanity, on scaling which you come to a sword-fight between two “wizards” of swordsplay (better than Masters). From there, you go to a show of strength and then followed by a show of brains (OK, intellectual prowess, not actual “show” of brains). Then a headlong slide into a valley, and through fire swamps. Then you go back to the palace and the cave (where the prince keeps his hunting animals), where the final combat takes place (between Inigo Montoya and Count Rougen). Of course, I read the “good parts version”, not the “classic tale” (and the movie is fairly true to the book). 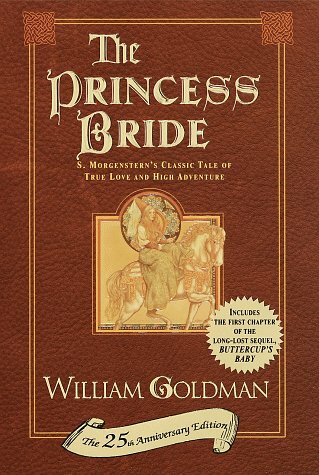 This apparently saved me 100-odd pages of packing and unpacking, 150-odd pages of wedding preparations etc., which make me realize that the classic tale (if it existed, but it doesn’t outside the mind of the author, William Goldman) might just qualify as the Barjatya Bible. I mean, think of pages upon pages describing the packing of the bags by a princess’ maids, and pages upon pages where they teach the farm-girl to be a princess and then of course, wedding preparations. But, the “good parts” version cuts down the romantic story to a minimum required amount, and with the side stories of Fizzik, the rhyming giant and Inigo Montoya, definitely makes this one book worth reading (and one movie worth watching). And no, it is not a “kissing book” as the name suggests. @Figo: Welcome back friend… after a long time. And yes, the story is completely lighthearted, romantic comedy. A nice read to relax you. I know. I think I have improved by now, with judicious use of small sentences and footnotes. Would love to know if you think so.